This guide explains how you can share your entire database (which contains all your glossaries, templates and autocorrects) between two computers. We describing the steps needed to share your phrases with Dropbox, but you can do the same thing by using any other cloud service (like Google Drive or Microsoft OneDrive) or even a shared folder that resides on your server. NOTE: This method is not suitable if more than one user is making changes to the templates at the same time as data corruption might occur. If more than one user needs to share data, you shall use shared glossaries instead. 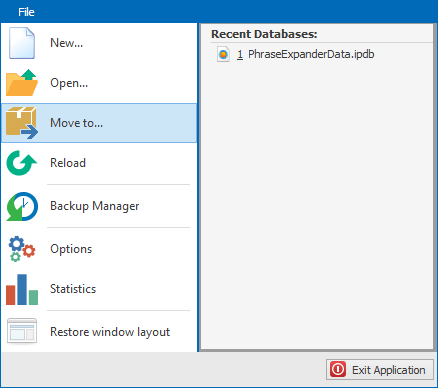 PhraseExpander will move the database file (by default called PhraseExpanderData.pedb) into that location. Now you are all set and your database will be kept in sync between those two computers. When you are now making changes on your Office PC, the changes will be sent to Dropbox and a message will pop up on your Home PC to notify that the database has changed, offering you the option to update it. The same thing will happen if you are making changes to your Home PC.